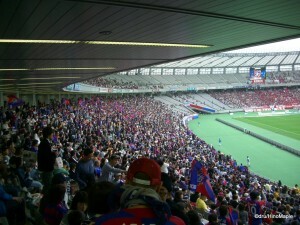 On October 26th, 2008, I made my third adventure of the year to watch Professional Japanese sports. 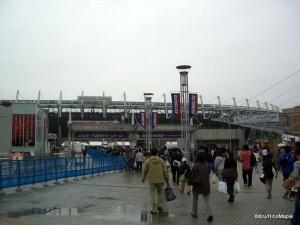 I headed out to Ajinomoto Stadium in Chofu to watch a football game. 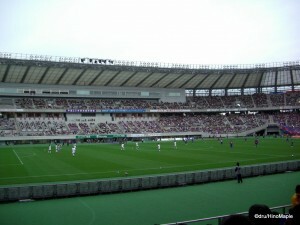 Built in 2001, Ajinomoto Stadium is the home of FC Tokyo and Tokyo Verdy. It was originally built as a track and football stadium, but it has yet to hold any athletics matches. Due to the nature of the design of the building, I’ve been told that the acoustics of the stadium aren’t good for football. I guess I agree, but unfortunately, I’ve never been to a purpose built football stadium. In general, I will say that the stadium is well built, but the overall design and layout needs to be improved. When I arrived at the stadium, I had trouble finding seats behind the home team goal. It’s also good to get information on where to sit before heading to the game. I spent 5 minutes asking a bunch of staff where to sit, but they weren’t too clear as to where it was okay. Thankfully, a fan helped me out and I discovered that half of the stadium was reserved for the home team fans. Again, unfortunately, I had to sit a little far from the die hard fans. Like baseball, football has a lot of die hard fans that will cheer and cheer and cheer. I was a little disappointed, but that is probably due to the design of the stadium. The fans aren’t close enough to the action. It could also be because FC Tokyo is a perennial low ranked team within the league. 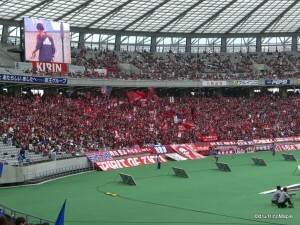 The second reason for the lack of sound from the home team could be from the loyal fans from the Kashima Antlers side. Kashima has a longer history than FC Tokyo and they generally finish at the top of the J1 division, and they have won the most J1 titles. Thus, they have a very loyal fan base. Before going any further, a little J-league education is needed. The J-league officially started in 1993 as a professional league and it has been evolving ever since. Currently, there are 18 teams in the first division (J1) and 15 in the second division (J2). Plans are underway to expand J2 to 18 teams. There is also a third tier under a league name of the Japan Football League, however this league is a semi-pro league. JFL teams will be promoted to J2 until J2 has reached it’s intended target. The J-league itself runs 2 series where teams can switch between both series. J1 is the top tier with the best teams. Currently, the lowest two teams at the end of the year are sent to the second tier, while the top two teams of J2 are promoted to the J1 series. The third ranked J2 and third lowest J1 team play a special match to decide if the teams will switch positions in the league or not. Ultimately, since Tokyo Verdy has had poor form in recent years, FC Tokyo is the Tokyo favourite, even tough Tokyo Verdy has a longer and better history within the league. The game itself was very good. Before things begin, both teams take to the field for a little warm-up. FC Tokyo came out and gave a type of bow and banzai gesture to the fans. Kashima came out much later, but they didn’t do the same bow and banzai. They just waved to their fans. 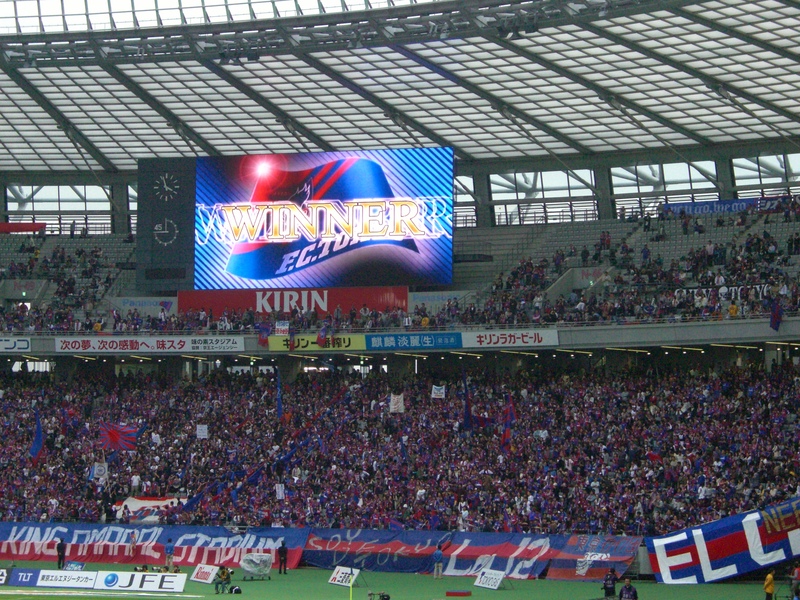 After the warm-up, FC Tokyo stole a Liverpool tradition and sang “You’ll Never Walk Alone”. I was a little disappointed because it’s such a strange song to sing for the Japanese people, and I thought a Japanese song or a lively song would be better. 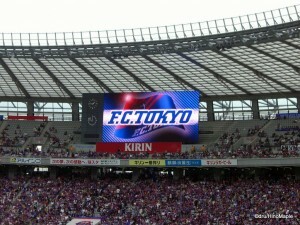 After the FC Tokyo “Anthem”, the game got underway. The first half was a decent game, but there were many slow points. A few scoring opportunities, but nothing much. The second half proved to be the better half. All 5 goals in the game were scored in the second half. FC Tokyo scored first, followed by a tie goal by Kashima. FC Tokyo then scored 2 goals followed by another goal by Kashima. There was a nail biting end to the game and 3 minutes of extra time. Obviously the referee wanted a tie game because there were barely any stops to the game. In the end, everyone was happy to see their team win. Even on on the Kashima side, the fans were happy and still cheered loudly for their team. So what are my final thoughts on the J-league, or at least the game that I watched? It’s definitely worth my 2000 yen. Should you go to a Baseball game or a Football game? I will definitely say yes to both. If you have the chance, go to them. However, do note that unless you have an interest in Football, I don’t recommend it. With Baseball, you don’t need to know the sport to enjoy the game. With Football, I can’t say the same. Personally, though, I think I’d enjoy Football more than Baseball. I just enjoy the action. This entry was posted in Football (Soccer) and tagged Ajinomoto, Ajinomoto Stadium, Antlers, Chofu, FC Tokyo, Football, J-league, J1, J2, japan, Japanese football, Kashima, Kashima Antlers, Kawasaki, Keio, Keio Line, League, Liverpool, professional football, Soccer, Stadium, Tobitakyu, tokyo, Tokyo Verdy, Tokyo Verdy 1969, Verdy, Verdy Kawasaki by Dru. Bookmark the permalink. Sure do agree with your post, the fact’s are loud and clear. Keep up the extrodinary work!